If I asked you how many and which wines you have in the cellar of your restaurant, would you be able to answer? Do you have a fast and reliable tool that give you an updated wine list every time you need? If sometimes you ask these and other questions, and you would like to change the way you manage the wine cellar and the wine list, we inform you that there is an easy way to free yourself from the heavy burdens that this activity entails. Its name is Enoweb, and is the first specific software for high-class restaurants which can simplify the management of your cellar and your wine list, even and especially if large. Designed for restaurants and wineries medium-high level, is not a general management software that was simply "adapted": it was created especially for those who must always keep under control the wine cellar, and wants to do it in the best way. 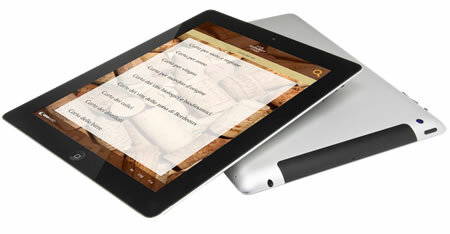 Give your customers the wine list also in digital format on a tablet or smartphone. No more marks in pencil, corrections, annotations ... no more continuous reprints at every small change in the cellar. The main problem today is that you wine cellar and wine list are independent entities, and keep everything under control it becomes a struggle. enoweb creates a link, so you can know what is going on in every moment. Build your list by selecting the wines with the most complete datasheets you can imagine, ready for you. Thanks to our database with thousands of wines already coded and continuously updated, every label in your cellar will have a datasheet with a lot of technical information of the wine. Varietal, producer, production area, data winemaking, vintage, are only some of the information that you can show your customers. At each price range of the wine, you can set a coefficient to calculate the selling price, both for bottles and by the glass. This feature allows the sommelier to limit errors and have an homogeneous sales policy. With Enoweb you can handle also spirits and craft beers, if they are part of your price list. The International Cooking School - Alma Wine Academy - for the management of the teaching wine cellar is using Enoweb, to properly teach the future sommelier the most correct way to control and manage the wine cellar and wine list. Information request has been sent. We'll contact as soon as possible. Request form is not working. We invite you to retry later.